Stencil computations are commons in High Performance Computing (HPC) applications, they consist in a pattern that replicates the same calculation in a data domain. The Finite-Difference Method is an example of stencil computations and it is used to solve real problems in diverse areas related to Partial Differential Equations (electromagnetics, fluid dynamics, geophysics, etc.). 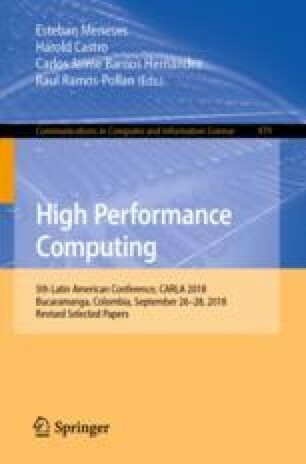 Although a large body of literature on optimization of this class of applications is available, the performance evaluation and its optimization on different HPC architectures remain a challenge. In this work, we implemented the 7-point Jacobian stencil in a Source-to-Source Transformation Framework (BOAST) to evaluate the performance of different HPC architectures. Achieved results present that the same source code can be executed on current architectures with a performance improvement, and it helps the programmer to develop the applications without dependence on hardware features. This work has been granted by the Coordenação de Aperfeiçoamento de Pessoal de Nível Superior (CAPES), the Conselho Nacional de Desenvolvimento Científico e Tecnológico (CNPq), the Fundação de Amparo à Pesquisa do Estado do Rio Grande do Sul (FAPERGS). Research has received funding from the EU H2020 Programme and from MCTI/RNP-Brazil under the HPC4E Project, grant agreement n.o 689772. It was also supported by Intel under the Modern Code project, and the PETROBRAS oil company under Ref. 2016/00133-9. We also thank to RICAP, partially funded by the Ibero-American Program of Science and Technology for Development (CYTED), Ref. 517RT0529.